SOOO.. My super awesome therapist, Tess, told me about a family she is seeing that has a baby who is 4 months old and has Down syndrome. She mentioned that the family would love to talk with us and she gave me their number. I was really excited as I don't know anyone else who has a baby with Down syndrome. I called right away and we seemed to have more than just Down syndrome in common and it was a great talk, until..... she said these words.. "I swear our baby seems like a really high functioning Down syndrome baby". Oh. See, I am a pragmatic person so either her and I have the only two high functioning Down syndrome babies in Gilbert, AZ or I am in denial about how things should be at this stage. Ella seems so normal (ok, I know she doesn't babble or sit up or always hold her head up) but I swear that from what I thought she would be like to what she is really like, she seems as normal as could be. When you get a diagnosis like Down syndrome, the books make you believe that from the minute that child breathes air you will notice they are different. You get signed up for therapies and early intervention plans, you have people from the state at your doorstep evaluating your little baby for life long care benefits. You get sucked into this abyss of "wow" this is serious stuff. BUT, you have this baby and for the life of you, this baby seems so normal, so peaceful and perfect and beautiful. You realize all these people are here to help make her "more mainstream" but when you are alone with just her, you don't see this diagnosis, you see just a baby. It messes with you. Hearing this other mom say those words was a good wake up call but also comforting. It's nice to know that someone else think and feels the same way I do right now. 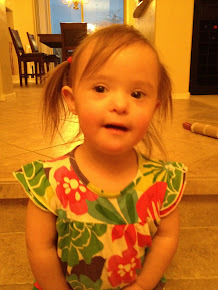 Right or wrong, we both believe our babies are the little miracle Down syndrome babies of Gilbert, AZ! Losing a nanny isn't as bad as it seems when the new nanny rocks. Our nanny of four years up and quit on us by text about a month and a half ago. Yeah, it sucked. I don't really get why she quit other than she wanted a $2 an hour raise and we offered a $1. I know that in the midst of her quitting Ella was in the hospital, Mike's dad was in the hospital, work was busy, etc, so we focused more on getting through the weeks rather than her absence and somewhere along the way we learned to make do without her. Brigid stepped in like a gift from god and watched the kids this summer and we found a great nanny finder person (NannyPoppinz in case you need a nanny finder) and she sent us Roxie and Roxie interviewed with us and she was wonderful from the start. She's British and full of energy and today my children told me they like her a lot because she plays great games with them. She came with glowing reviews and seems like she can make my life easier and I will miss Brigid but since she won't give up being a teacher, I think Roxie will work out just fine!